Iluminate ! Three atmospheric days and evenings of amazing interactive light artworks in Southside. Commissioned by Birmingham Hippodrome, Sonia Sabri Company will perform as part of this weekend's Illuminate Festival. We hope to see you there! Featuring a 360° film igloo; a light inspired live dance performance; a series of interactive street projections; and from Shanghai, the Lanterns of Terracotta Warriors Exhibition. Make a night of it, grab a bite to eat en route from our hub and explore Southside in a different light this autumn. All attractions are within a five minute walk of the theatre and each other. LeTruc will receive a FREE Illoom glowing balloon. Mr Wilson’s Second Liners Band will lead a glowing procession down to Gallan Car Park at 6.30pm in time for Echolalia at 7pm, and again at 7.30pm in time for the 8pm show. Pop into the lovely French restaurant Le Truc, our hub space for Illuminate, where you can find special cocktails and buy a good old fashioned hot dog to take away. Photographs of Southside faces, colourised as pop art posters will contribute to an everchanging stream of local portraits, creating a mind blowing, gigantic wall of colour. Be part of Southside Faces by dropping in to the photoshoot on Mon Oct 7, 12noon till 7pm at Hippodrome Square. FlameOz will light up your evening with stateof- the-art LED technology and awe-inspiring choreographed fire dancing. These virtuoso circus artists draw complex patterns in the air with stunning kaleidoscopic visuals and fi rebased special effects. Guaranteed to thrill! performance over three days. Projections are layered with movement, gesture, colour, shadow and sound to spark your curiosity and take you to another dimension. Inspired by communication, the word Echolalia means a child’s repetition of sounds uttered by others. 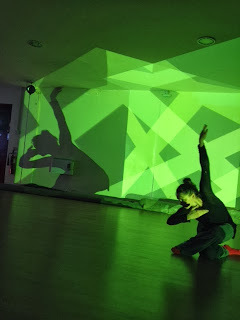 After each performance explore the lighting environment and create shadows and shapes of your own. Performer: Patsy Browne-Hope, live projected colour space: Andy McKeown, music: Sarvar Sabri. Commissioned by: Birmingham Hippodrome with support of DanceXchange. Drop in and be in the middle of the action! Get swept up in a series of amazing films projected in a 360° dome. An immersive experience for all ages, some of the best new 360° films covering sport, dance, music and movement. Curated for Illuminate by Toby Norman-Wright with ICCI, Plymouth University and Igloo Vision. Encompass 360° Digital Dance: Toby Norman- Wright and Chris Vandyke. Dancer: Sonia Sabri. Image: Lloyd Russell, Plymouth University.